Working as a subconsultant to Wilson & Co., CIG was responsible for managing the community outreach process from January to October 2017 when designers advanced the plans for redeveloping the north segment of Brighton Boulevard from the 30 percent level to 100 percent. The biggest challenge associated with outreach during this phase was setting realistic expectations with the community in terms of how much input they could have in the process. With design plans being preliminary in nature, it was also difficult to determine what to show community members without setting the expectation that what they were seeing was definitive. Communication efforts were split into two phases with the first phase dedicated to reminding people what the 30 percent plans looked like and gathering their input on these plans. The next phase focused on how the community’s input was being reflected in the design plans. This strategy paralleled the process of taking the design plans from 30 to 60 percent and then from 60 percent to completion. We shared project information at various community buildings (Perry-Valdez Library, Focus Points, Swansea Elementary School, Swansea Recreation Center and Colorado Miners Community Center) and worked with representatives at these organizations to share project information with their customers and constituents. City and County of Denver staff that already had relationships with these community members were instrumental in the outreach process. A "sticky dot" board was used to gather community input at the first open house meeting. 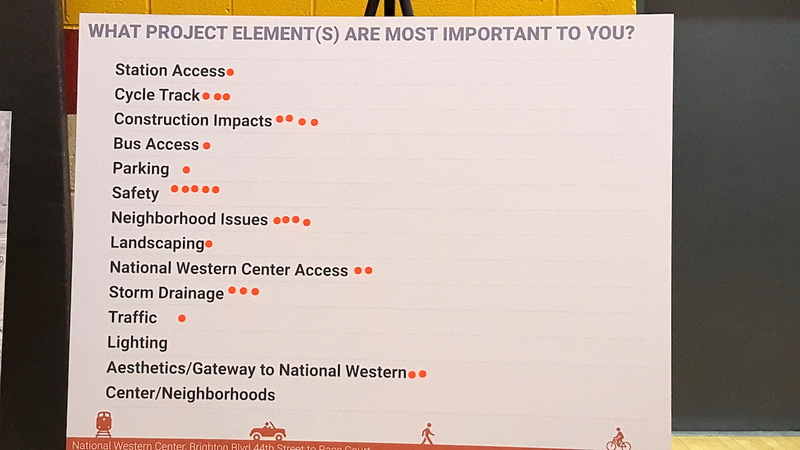 In gathering community feedback, project elements people were most excited about were the cycletrack/dedicated bike lanes and improved pedestrian facilities, and their top two priority issues were improving public safety and making it easier to access the National Western Center.